Our portable self storage units are the perfect solution for your personal or business storage needs while moving, relocating, or renovating your home. 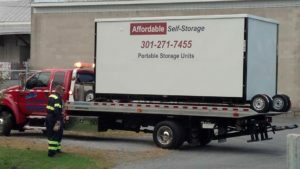 Affordable Self Storage, in Thurmont, MD, will deliver a portable storage unit to your home so you can pack the unit at your convenience. Our units are 8x16x7. Give us a call at 301-271-7455 to learn more and for current pricing.